Take a tour of the most amazing landmarks and cities in Texas! God Bless Texas will show readers how special their state is and how God made such a wonderful place for us to live. God Bless Texas by Peter Francis is incredibly adorable! I love that this book is educational but also focuses on giving God credit for our wonderful state of Texas. I also love that you learn all about Texas' landmarks. My kids absolutely love this book and think the illustrations are very cute and colorful just like all children's books should be. God Bless Texas by Peter Francis would be an awesome book to add to your collection if you live in Texas or are planning any trips to visit. Of course neither apply to my family right now but Texas is definitely on our list to visit someday, especially after reading God Bless Texas by Peter Francis! 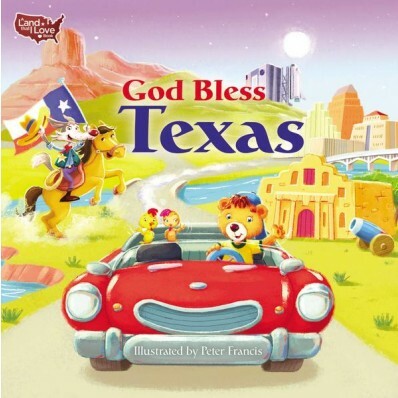 You can find God Bless Texas by Peter Francis on Amazon, Barnes and Noble, Zondervan and other bookstores.